Dimensions 0.70 by 9.10 by 6.10 in. 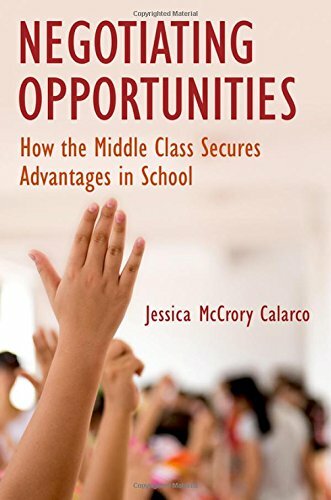 Amazon.com description: Product Description: In Negotiating Opportunities, Jessica McCrory Calarco argues that the middle class has a negotiated advantage in school. Drawing on five years of ethnographic fieldwork, Calarco traces that negotiated advantage from its origins at home to its consequences at school. Through their parents' coaching, working-class students learn to follow rules and work through problems independently. Middle-class students learn to challenge rules and request assistance, accommodations, and attention in excess of what is fair or required. Teachers typically grant those requests, creating advantages for middle-class students. Calarco concludes with recommendations, advocating against deficit-oriented programs that teach middle-class behaviors to working-class students. Those programs ignore the value of working-class students' resourcefulness, respect, and responsibility, and they do little to prevent middle-class families from finding new opportunities to negotiate advantages in school.